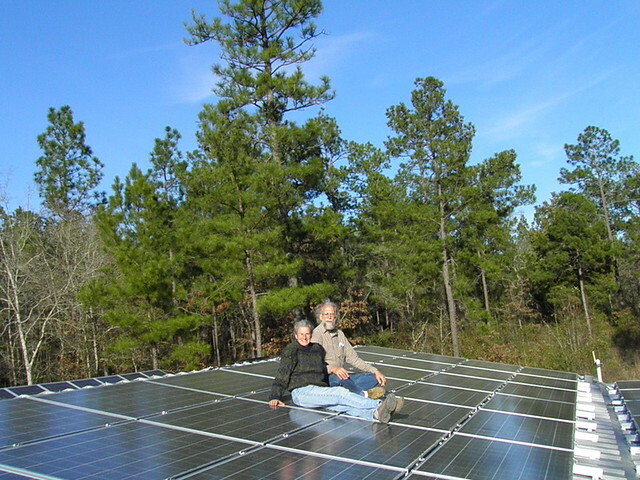 Gretchen Quarterman and John S. Quarterman on the new panels on the roof of the farm workshop at Okra Paradise Farms, Lowndes County, Georgia, 29 January 2012. You can see the old panels sticking up on the left, and we're sitting on some of the new panels, which continue on the lower roof on the right. Eligible projects include those that derive energy from a wind, solar, biomass, or geothermal source, or hydrogen derived from biomass or water using wind, solar, or geothermal energy sources. The REAP program will probably be renewed this year, so if you have a farm, you could apply. We also applied for and got a U.S. Treasury 30% grant from the 1603 Program: Payments for Specified Energy Property in Lieu of Tax Credits. That program was funded by the The American Recovery and Reinvestment Act of 2009 (Recovery Act). Finally, there is the Georgia Environmental Finance Authority (GEFA) 35% Clean Energy Property Tax Credit, which will apply in parts over four years. That all adds up to 90% covered by grants and tax credits, which is a pretty good deal. Now that remaining 10% is still a significant amount; like the price of a small car. But in 7-15 years (how long it will take to pay off this system, depending on how you figure it), what would the value of a car be? Much less than when you bought it. Meanwhile, these solar panels will be generating almost as much power as they are now, and they will continue to generate for at least a decade more, probably much more. The big missing piece is up-front financing. For more on that, see other blog post. Meanwhile, we have here on our workshop roof a proof of concept, operational right now. by Leon Neel, with Paul S. Sutter and Albert G. Way. Leon Neel was a atudent, apprentice, and successor of Herbert Stoddard, who was originally hired by quail plantation owners around Thomasville to figure out why their quail populations were decreasing. The answer included a need to thin and especially to burn their longleaf pine tree forests. Stoddard and Neel studied and practiced for almost a century between them on how to preserve and increase the amount of standing timber and species diversity while also selectively harvesting trees to pay for the whole thing. Their Stoddard-Neel Approach is written up in textbooks. In this book we learn how it came about, and how it is basically different from the clearcut-thin-thin-clearcut "efficient" timbering cycle that is the current fad among pine tree growers in the southeast. Unlike other biomass gasification, the Eprida process can operate at small scale, converting waste biomass into fuel and fertilizer. The diesel produced will ultimately be more valuable than ethanol or methanol, and the Eprida process can convert woody plant materials that cannot be cost effectively fermented. Also, unlike virtually all other approaches for biomass to energy, which deplete soil nutrients, the Eprida process restores and enhances soil mineral, carbon and nitrogen content. As a direct result of this new approach to integrated energy and fertilizer production from biomass, the Eprida process effectively removes net CO2 from the atmosphere, and can do so profitably before the value of any carbon credits are even considered. I especially like the small scale aspect. Individuals could do this. Or municipalities like Valdosta or Lowndes County could do this, instead of the current plans for a conventional biomass power plant that looks like it will release more CO2 per kilowatt than a coal plant. Why not go with a homegrown technology that's cleaner and may also produce diesel as a side effect? Much current discussion of the ACES climate bill that passed the House is about whether it will really cost one postage stamp per person per day, or maybe two stamps. This is like arguing what microcomputers will be used for in 1980. I fondly recall a prediction that "We'll never sell millions of them unless there's one in every doorknob!" Well, look at your average hotel today: there's one in every doorknob. As for modeling innovation, that’s always been the Achilles heel of economic forecasting. In this piece, Eban Goodstein and Hart Hodges trace a history of cost overestimations around environmental regulation. Again and again, models have underestimated the pace of business and technological innovation. Vinod Khosla was one of the founders of Sun Microsystems, the company that mainstreamed computer workstations, has long been a venture capitalist, and has been investing successfully in renewable energy for years. The little red square in the Nevada desert is all the area it would take to power the U.S. with solar panels. And that's before further efficiency improvements. No reason it all has to be in Nevada, of course: Georgia has a lot of sun. Distributed is better than centralized. Owners of large tracts of forest land also will get a lot of interest from the business community. Like farmers, environmental experts see them as a huge player in the carbon economy because of their natural ability to absorb carbon. Louis Blumberg, director of climate change for the Nature Conservancy's California chapter, envisions a system in which forest owners could make money simply by signing an agreement to cut down fewer trees for lumber. The Nature Conservancy did just that last year with the Conservation Fund, a nonprofit agency that owns about 24,000 acres of redwood and douglas fir forest northwest of San Francisco. The groups changed the logging schedule on the property, and the fund expects to receive about $2 million from Pacific Gas and Electric, which participates in a regional climate initiative similar to the one that the Waxman-Markey bill would create around the country. "This is really a model of what can happen," Blumberg said. 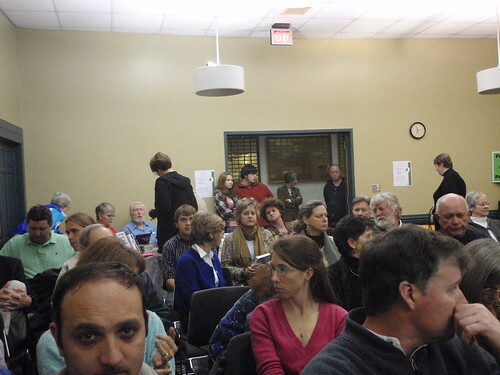 "Property owners everywhere want to figure out a way to be part of this." The picture is of Garcia River Forest, "recognized by the California Climate Action Registry as a certified source of carbon credits." The Waxman-Markey American Clean Energy and Security Act just passed the House by 219-212. It's not entirely clear what's in it, considering the 300 pages added yesterday. But if it's anywhere near as good as its proponents suggest, it's a step in the right direction. Now we'll see if it can get through the Senate without the oil industry turning benefits for renewables into renewable subsidies for the oil industry. 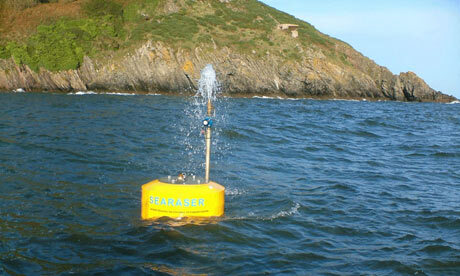 Someone named Alvin Smith has invented a simple buoy-driven pump to push water uphill from the sea. From there it can flow downhill through turbines to generate power when needed. We don't have any cliffs on the Georgia coast, but I suppose we could build water towers. More efficient, dependable, and shorter than wind turbines. 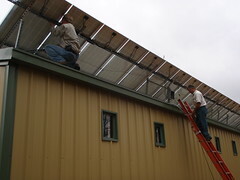 First solar installation in Lowndes County, Georgia. Actually, I'm told there is one other, installed way back in the 1970s. However, this is the first one Colquitt Electric has had on its grid. Since Georgia in May 2008 passed a 35% property tax rebate on solar installations, maybe we'll see more solar around here. 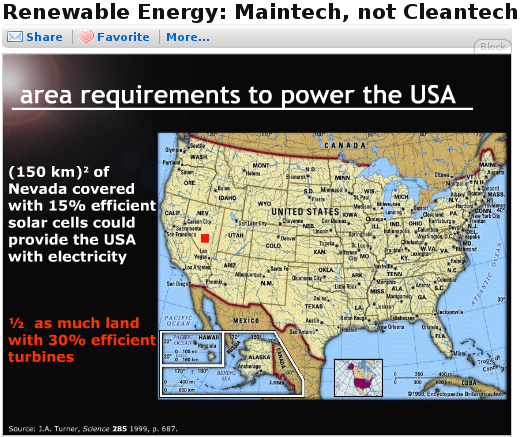 Especially since Congress in fall 2008 passed a 30% solar tax rebate. Add those up, and the effective price of solar comes down quite a bit. This installation was done by Georgia Solar Power Company. 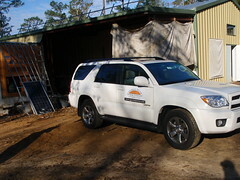 Ben Browning of Georgia Solar Power brought in Craig Overmiller of Texas Solar Power Company to assist with this one, but from now on Georgia Solar Power should do fine on its own. Click on the pictures for more pictures on flickr.